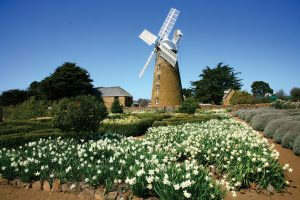 Callington Mill - Built in 1837 and is the third oldest windmill in Australia. Holyrood House (1840) was originally built for the local police magistrate. The Midland Highway runs right by this tiny town. It's 83 kilometres and a 1 hour drive north of Hobart. It's a little farther to Launceston which sits 116 kilometres and an 1.5 to the north. Over 150 sandstone buildings stand in Oatlands. This is one of Tasmania's oldest settlements and it boasts unchanged Georgian architecture. Much of the town was built in the early 1800's using free convict labor, and despite its tiny size, it packs plenty of history. You'll be able to enter many of these sandstone buildings as they now operate as stores, cafés and accommodations. And Oatlands is surrounded by some of the most fertile lands in all of Tasmania, so you'll be able to enjoy incredibly fresh food. And after you fill up with a hearty meal, walk around town to drink in some of its history. After a day exploring the streets of Oatlands, head on out to Lake Dulverton on the edge of town. Take your binoculars to spot some of the rarest birds in all of Tasmania. Picnic areas dot the shoreline and the lake is incredibly popular with fishermen. Feel free to take advantage of the many nature walks around the conservation area. With its mix of history and outdoor activity, Oatlands is becoming more recognized for its stopover potential. 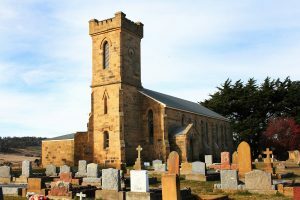 Many travellers of the Tasmanian island make sure to spend a day or two in this tiny town to take advantage of its history and the lake before moving on to their next destination. Smart travellers use Oatlands as a casual stop on their exploration of Tasmania. It's worth a few hours to wander the streets reading the historical signs and marveling at the sandstone buildings. And the afternoon begs for a picnic out at Lake Dulverton. It's truly a relaxing escape from the road. Fishermen descend on Oatlands from all over the state to take advantage of Lake Dulverton. The lake is big enough for a fisherman to find some seclusion for a relaxing day on the water. And the recreation area's barbecue pits are a perfect place to enjoy a day's catch. The town's main road, High Street, runs alongside the lake shore. This street is full of history and lined with hotels and cottages catering to travelers from all over the state. The Callington Mill is still in operation after being built in 1836. You can find it on Old Mill Lane. This 2-storey flour mill was driven by wind and steam before it was razed by fire in 1912. It has been restored by the National Trust with public funds. The Court House can be found on the corner of Campbell Street and The Esplanade. Built with convict labour in 1829, it is the oldest building in town and a unique example of Georgian architecture. Marvel at its 12 pane windows before heading down High Street to check out more sandstone buildings. The White Horse Inn is on Main Street and was built in 1834. It has changed names through the years from Lake Frederick Inn to the Dulverton Inn. It eventually became known as the White Horse in 1853 and it retains the name to this day. The Holyrood House was the original police magistrate and was built back in 1840. It was bought by a doctor in 1860 and became the town's doctor's office. It has a beautiful garden and is one of Oatlands's most impressive buildings. You can grab a hearty meal and a pint in one of town's hotel pubs. You'll also find a roadhouse and a local restaurant on High Street near the waters of Lake Dulverton. 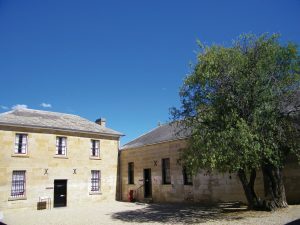 Oatlands was chosen by Governor Macquarie to be a military post on the road between George Town and Hobart. The arrival of the military garrison in 1825 began the town's development. The governor sent a group of men to clear land to establish the development of the town and sent a garrison to guard the construction from resistance by the Indigenous population. The government commissioned the construction of many sandstone buildings in the area and now those buildings draw tourists from all over the world. Start your walk-through town on Campbell Street at the Court House. 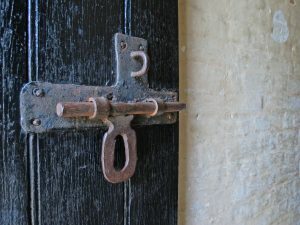 It was built by convicts back in 1829. 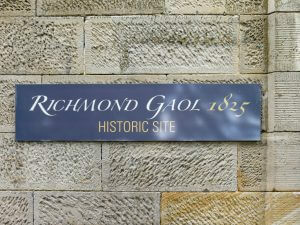 Then continue your walk past the old gaol, a row of colonial cottages and then down High Street.